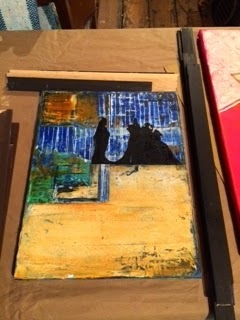 The Oil and Cold Wax pieces are up at the Fair Trade Coffee House in Madison, Wisconsin from Sept.-Nov. If you are in the area have a look and enjoy the great coffee. Now that the Fair Trade Show is up I am working on the next....St Paul Art Crawl in Oct. I am thinking to frame the rust print paintings that I've done over this last year. I spend the morning going through them and picking out what I like best. Now to figure out how to frame them hmmmm. On our way to Madison to put up the show we stopped at a little town in Wisconsin called Hixton and found the best rusty bits!!! This mudding tool had the most wonderful marks on it and such beautiful color of rust.